Gummy candies are some of the most loved creatures of the candy world. There’s a full spectrum of living things represented in the ooey gooey gummy-sphere: worms, fish, fruits, frogs, sharks, and the ever popular godfather of them all – the gummy bear. The chewy bear seems to have been around forever, but how did the first cub get gummied? 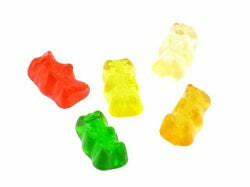 We can owe our gratitude for the gummy bear to Mr. Hans Riegel of Bonn, Germany. Bored with his day job, Hans decided to go out on a limb and began making candy under the business name Haribo – a combination of the first two letters of his first and last name, and his hometown. His first product was a clear, hard candy that his wife delivered via bicycle anywhere her legs could carry her. Now, colorless hard candies aren’t the most exciting things in the world, and Hans soon realized his sales weren’t doing as well as he initially thought. Back to the drawing board! Before now, the only mildly gummy-like candies were more of a hard jelly than anything else. These candies intrigued Hans, and soon he set out to improve upon these old favorites. He boiled gelatin, fruit, and sugar together and soon created a recipe that had a satisfying bounciness and a much more engaging chew than the jelly predecessors. Molded into the shape of German dancing bears, this snack soon proved to be a huge hit. Hans had in his hands a new phenomenon in candy. The popularity began growing steadily until Hans’ death in 1945, when the company was passed on to his two sons. They kept the dream alive, and in 1960 the brothers began mass marketing the bears to all of Europe. Soon, German teachers in America were showing their students gummy bears as a sample of foreign food, and American soldiers stationed in Germany were bringing back this sweet chew as souvenirs. Demand was growing, Haribo trademarked the term Goldbären or, Gold Bears, and in 1982 they set up shop in the United States. 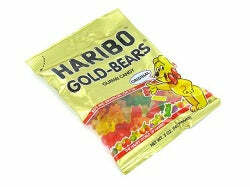 Certainly no other candy has had a breadth of influence as wide as the Gold Bears. They have taken pop culture by storm – inspiring songs, tv shows, movies, and gathering a huge and extremely loyal fanbase. Pick up some gummies yourself and share in this worldwide phenomenon! Viva la Gold Bears!